The U.S. Food and Drug Administration announced the delay on Sept. 29. The food industry hailed the delay, while consumer organizations said it is detrimental to public health. Current labels, left, provide information based on smaller portions than most consumers eat, according to federal research, and use small print to disclose calories. The new labels, right, define portion sizes more in line with how people eat and prominently display the calories in bold type. The new labels also show how much sugar has been added. In the announcement, FDA said it was releasing a proposed rule to extend the compliance dates for the Nutrition Facts and Supplement Facts label final rule and the Serving Size final rule from July 26, 2018, to Jan. 1, 2020, for manufacturers with $10 million or more in annual food sales. Manufacturers with less than $10 million in annual food sales would receive an extra year to comply — Jan. 1, 2021. 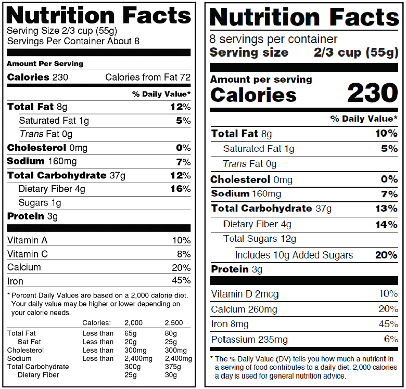 FDA finalized the Nutrition Facts and Supplement Facts Label and Serving Size final rules in May 2016. FDA determined that additional time would provide manufacturers covered by the rule, and with necessary guidance from the agency, would help them to design and print updated nutrition facts panels for their products before they are expected to comply. The McLean, VA-based American Frozen Food Institute (AFFI) was among industry representatives that reacted positively to the deadline extension. “AFFI commends the U.S. Food and Drug Administration’s decision to provide frozen food and beverage makers additional time to implement changes to the NFP until Jan. 1, 2020,” Alison Bodor, president and CEO of industry group. Dr. Peter G. Lurie, president of the Center for Science in the Public Interest (CSPI), was also swift in getting a statement out. He charged FDA with caving into the food industry’s demands while obesity rates continued to climb. The new nutrition facts label, according to FDA, will help consumers make “better-informed food choices.” The added information is supposed to link diet and chronic diseases like obesity and heart disease to better inform consumers. The “iconic” look of the label remains, but with significant updates to ensure consumers have access to the information they need to make informed decisions about the foods they eat. These changes include increasing the type size for “Calories,” “servings per container,” and the “Serving size” declaration, and bolding the number of calories and the “Serving size” declaration to highlight this information. Manufacturers must declare the actual amount, in addition to percent Daily Value of vitamin D, calcium, iron, and potassium. The gram amount for other vitamins and minerals may also be listed. “Added sugars,” in grams and as percent Daily Value, will be included on the label. Scientific data shows that it is not easy to meet nutrient needs while staying within calorie limits if you consume more than 10 percent of your total daily calories from added sugar, and this is consistent with the 2015-2020 Dietary Guidelines for Americans. The list of nutrients that are required or permitted to be declared is updated. Vitamin D and potassium are required on the new label. Calcium and iron will continue to be required. Daily values for nutrients like sodium, dietary fiber, and vitamin D are being updated based on newer scientific evidence from the Institute of Medicine and other reports such as the 2015 Dietary Guidelines Advisory Committee Report, which was used in developing the 2015-2020 Dietary Guidelines for Americans. The daily values are reference amounts of nutrients to consume, or not to exceed, and are used to calculate the percent Daily Value (% DV) that manufacturers include on the label. The %DV helps consumers understand the nutrition information in the context of a total daily diet.